Milagoottal or Kootaan is a Kerala derivative into Tamil cuisine and since my roots are in Tirunelveli which is almost close to the Kerala border, some of our dishes have the ‘ubiquitous to Kerala’ coconut ground in the gravy of the vegetables. Aviyal is as much our cuisine as much as it is a part of the Keralite sadya. So is the milagoottal, which we call Keerai Kootan at home. 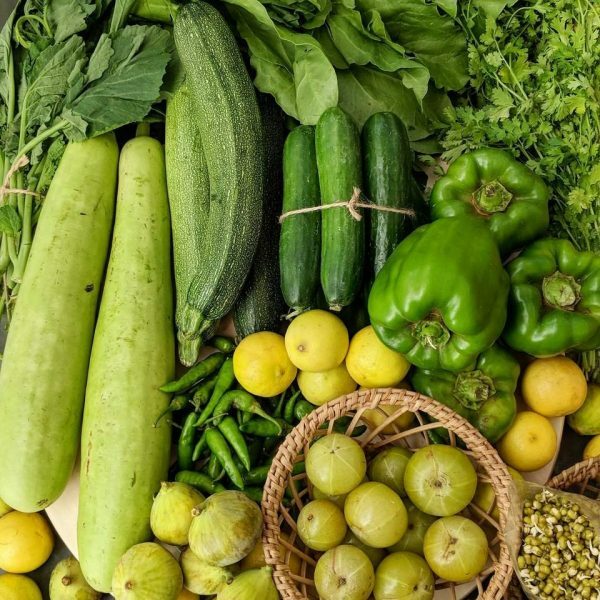 This goes well with a manga pachidi, in which the tender mangoes that have been used to make the vadumanga pickle are removed from the spicy brine, washed and ground to a coarse paste, which is then mixed into yogurt. Nellika / Amla Pachidi is also a great accompaniment. For me, there is no better way than keerai kootaan to consume spinach. Mashed fresh spinach leaves mixed with mashed cooked paruppu (tur dal) and spiced with a mix of fried red chillies-udad dal – black pepper-rice grains is the perfect way to get my dose of iron, protein and comfort for the day! 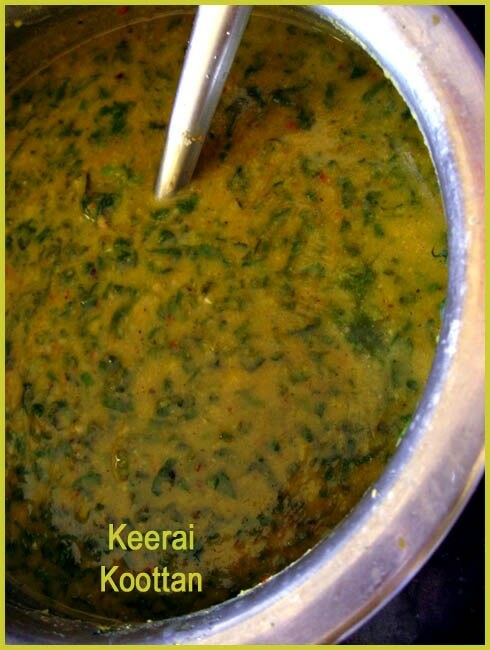 Recipe for Keerai Kootan: We start by preparing the spinach. Take 2 bunches spinach. Pluck the leaves and tender stems. Washed thoroughly in bucket of sink full of water, several times. Chop finely. In a heavy pan, place the chopped spinach with a pinch of salt and 1/4 cup water. Boil the spinach till wilted and mash with back of a round ladle. Do not cover while cooking to retain green colour. For spice paste, fry the ingredients for spice paste in 1/2 tsp oil in a wok till dal turns golden-Grind the above with 1/4 cup of fresh grated coconut, using upto 1/4 cup water into a fine paste. Remove from blender and keep aside. To cook the lentils, take under 3/4 cup of tur dal, wash well, pressure cook till very soft with 2 cups water. 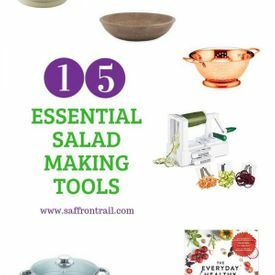 (2 whistles and on sim for 5 minutes)Mash this well with a ladle. Keep aside. Next is assembling all 3 parts and tempering the kootan. In a pan with the mashed spinach, add the mashed dal and the ground spice paste. Stir to mix well. Add salt to taste. Bring to a simmer. Remove from flame. For tempering:heat 1 tsp oil, to this add 1/2 tsp mustard seeds, 1 tsp udad dal, few curry leaves. Once seeds splutter and dal turns golden, transfer this tempering over the prepared kootan. Add the finely chopped cabbage, salt and stir for a minute or so on high flame. Cover and steam cook for a total for 8-10 minutes on a low flame. 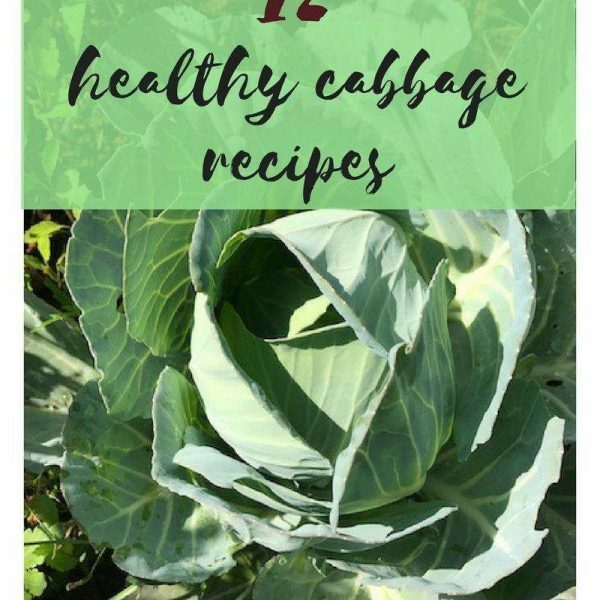 If you are making this in a light-weight kadai, you may need to sprinkle a little water 2-3 times so that the cabbage does not stick to the pan and burn. Once cooked, remove from kadai into a bowl, garnish with fresh coconut and serve hot. We’re also having very traditional food these days… 🙂 konkani, tamil and telugu 🙂 one at each meal. Being Kerala Iyers,Keerai Molagootal is a weekly feature in our house.Mom makes a tomato pachadi with it.I used to love the combo with a huge pappadam. Raaga – very nice 🙂 You have three traditions to follow as against my one :PShalini – any pacchidi goes so well with this one 🙂 and papaddams make everything taste good, isn’t it? 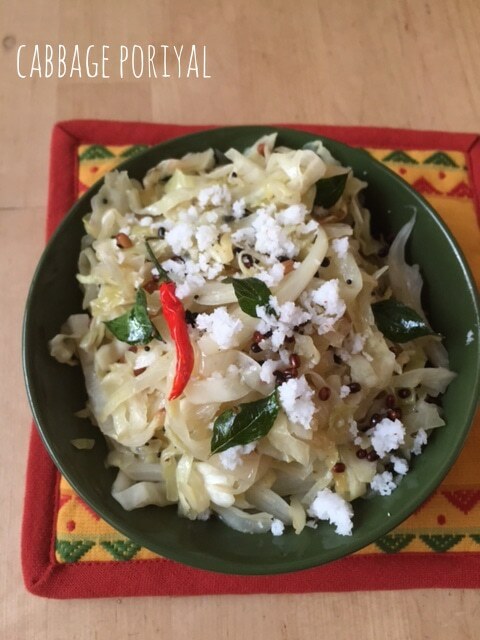 Keerai Molagootal is a regular item at my parents’ place, too, and one of my favorite dishes. You are so right about the simplicity of preparation, which makes each ingredient shine and sing!Kamini. Nandita: Your roots in Tirunelveli as well? Tell me you’re from Kadayam and I’m prepared to faint from the shock :)I’m going to make molagootal with kale now. wow! 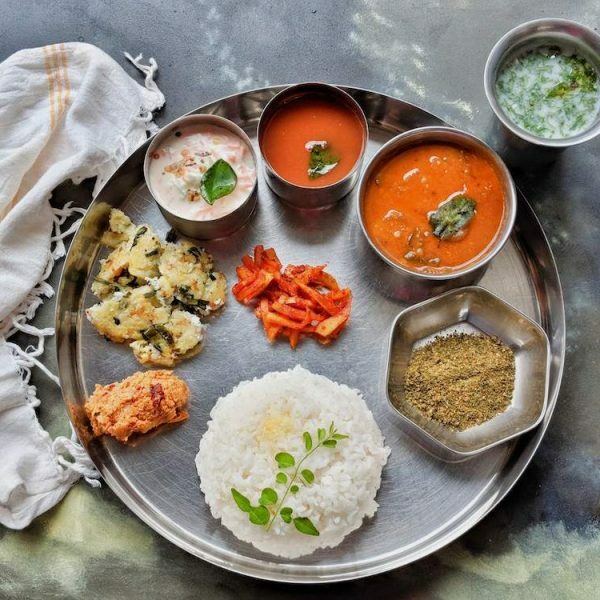 !i love this platter…simple things are the best ..must have been so tasty..
Oh I love those traditional meals. Adding cabbage to uttappam is a nice idea, i have to try it sometime. I am gonnu try this spinach dish when I buy spinach next time. Like your new series…..Vengaya sambar and potato roast is the usual combo in my home too…..It’s nice to see someone blogging about simple everyday recipes…. Kamini – It is such a comfort food and if a fried appalam is there for company then true nirvana :)Shyam – OK, now hope you have someone to hold you, my greatgrandma is from Kadayam :)And she has told me so many stories of how their house would have a room to hold all the coconuts from their trees and much more – BTW, I tried your Eggless Carrot Cake yday – romba romba super aa irundhudhu, despite making some changes due to lack of ingredients- will post that soon 🙂 Thanks!Deepa – Kari sounds like something else all together…we are the original ‘curry’ makers, the world continues to live in oblivion, so so be it 😛 Vathal kozhambu coming up soon ma’am!Ranji – Thanks dear, you are right about the taste!Shilpa – Do let me now how you liked our version of dal palak :)Jayashree – hope you enjoyed the classic combo! It’s going to be simple meals blogging for a while now.A-Kay – Had blogged my mom’s keerai masiyal earlier. But i like this one better as it gives more bang for a bunch of spinach.Latha – do let me know how you liked it…masiyal is one keerai dish, this is the second and pulikeerai is the third, where some tamarind is added to the masiyal. Aah, I wish I could subsscribe to this feed. As in, actually get a tiffin box full of it. And to think that I’m salivating over this entry immediately after having eaten my meal. Nandita, what accuracy – that chutney made with little Kanni manga and all. And, as always, great pictures. Ooh I love cabbage curry. Is udad dal the same as urad dal? Tried the keerai milagoottal. Was appreciated. Thank you. I have become a regular visitor to your blog. I tried this today. Had to substitute to frozen spinach and add a bit of coconut milk (tinned) instead of fresh coconut. Was really yummy! Just right when temp dipped to 1 C! Awesome .. totally delectable. This combination is pretty common in our house too as we hail from Tirunelveli-kerala border areas. Have always added 1tsp jeera in list of “to-grind” ingredients, never used raw rice, any specific reason for grinding raw rice – please let me know. Do you also add coconut in purble cabbage curry? ?